The gallery stands empty except for a large sloping gantry that runs the length of the space. The gantry is angled towards a large hole that has been cut from the wall panelling at the far end of the space where once a door stood The gantry itself is constructed of components hired from an industrial supplier and is equipped with a small gurney that runs along its length. Suspended from the motorised gurney is the door that previously stood where the hole is now. 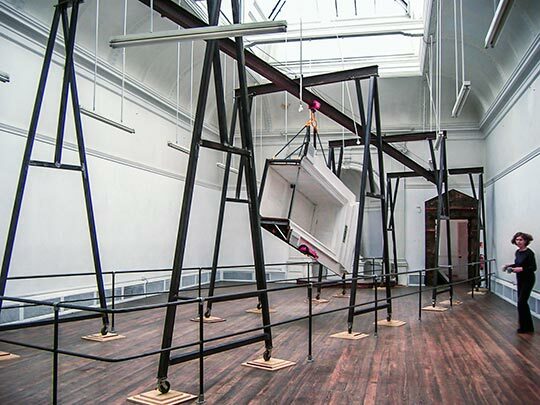 Tipped over, the door is strapped carefully as if being removed from the space by art handlers. 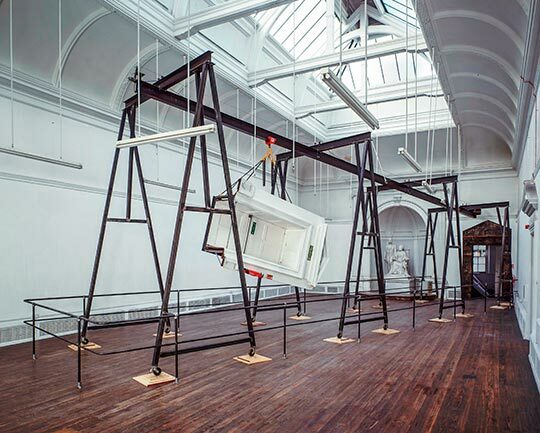 Throughout the exhibition the door travels up and down the gantry bashing into the hole at each descent suggesting aggression against architecture.